No more Hoopoe but time for a Dotterel? Went to Stibbington again at lunchtime to look for the Hoopoe. No joy. There was a fantastic field full of dandelions next to the sewage works, though... looked great for Linnet and Goldfinch. I think it's time to start looking for Dotterel in peafields. After the morning's excitement, I went to Ferry Meadows again this afternoon. A bit stupid of me really, since it's so busy on sunny weekends. Anyway, I enjoyed the walk and took some not-too-bad photos, and watched some interesting interaction between a Sedge Warbler and a Whitethroat. On the long walk round Gunwade Lake, there were plenty of fish-wielding Common Terns and some Pied Wagtails on the water's edge, plus one smart male Yellow Wagtail. But most definitely no White Wagtails. "Good morning. Have you just woken up?" I was rudely awoken from my sleep this morning by my mobile phone. I didn't recognise the number. My first dozy thoughts were a) is it Monday and should I be at work? and b) it'll be someone trying to flog me something. Fortunately, I answered, for it was Martin Coates telling me that there was a Hoopoe at Stibbington. That was enough to get even me out of bed on a Sunday morning, so I woke up a bit and went to see it. By the time I'd found my way there, a few other birders were already on the scene, including its finder, Brian Stone (he found another one at Elton Furze last year but it vanished and wasn't seen again). The bird was last seen poking around on the edge of an unmade track. Of course, Hoopoes are famous for feeding on lawns belonging to vicars, and Stibbington Hall, just around the corner, had what we considered a highly attractive lawn, ideal for a hungry visiting Hoopoe. It obviously disagreed, because it popped up again in its original position and we all had a good eyeful until it flopped away. Most people left at this point, but a few of us decided we might as well wait, since we were there now, and our patience paid off. The Hoopoe returned and seemed happy to feed quite close to where we were. Though it was scared off twice by dog walkers and a Magpie, it always came back to the same spot, and the last I saw of it was when it trotted off round the corner and out of sight. My first Hoopoe in the PBC area - what a fantastic bird! I got some OK photos of it, which you can see at the top of this post and also here. Another post-work visit to Ferry Meadows CP. I headed for Coney Meadow again since the park was still fairly busy. If last Friday was the day of the Willow Warbler, this week it was Reed Buntings which were singing all over the place. At least five males sang in stereo within a small area of hawthorn scrub. 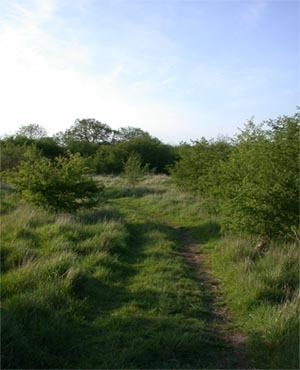 I tend to think of them as inhabitants of fen, rather than scrub, but I think they know what they're doing. There were two male Whitethroats duelling among the brambles, too. I tried for ages to get photos of one of them, but gave up playing cat-and-mouse after a while... Nice to see them back, though. What else was about...? About ten Common Terns were around Overton Lake, and it was interesting to see that two of them had BTO-type metal rings on their right legs. 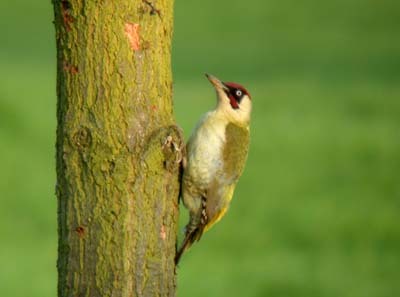 A Green Woodpecker was very vocal along a line of oaks nearby. I finally caught up with him when he flew to an isolated tree in the middle of the meadow, and I got a half-decent photo! Green Woody is one of my favourite species. Very charismatic. The Cormorants were on the Overton Lake island, as usual. 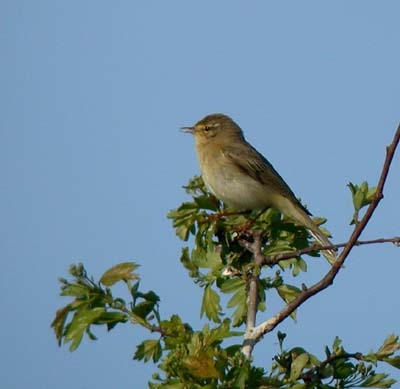 Went out to Castor Hanglands at lunchtime to bag my first Grasshopper Warbler of the year. It was distant, but it'll do for now. It looked like it ought to be a good day for a fly-over raptor, but we didn't see any. I meant to get up early this morning but I stayed in bed until 07:15. Lazy. I drove to Eldernell in the hope of seeing a Ring Ouzel. It was a lovely morning, but there were none there, and no Wheatears either. Oh well. You can't have everything. Instead I concentrated my efforts on trying to digiscope singing birds. I hoped they'd be sitting fairly still, but it was the usual story of birds buggering off just when I was ready to take a picture. I was all set to get what I thought would be some fantastic pics of a singing male Blackcap, but every time I pressed the shutter, he was facing away from me! Finally, I got one half-decent image. I don't mind. Fortunately, the Nene Washes is the kind of place where you can return, having seen nothing, and not feel too hard done by. Some of the best birds were by the car as I arrived: a Barn Owl floated by over the meadows, with Black-headed Gulls in close attendance (but keeping a safe distance). By the sluice gate on Morton's Leam, a pair of Pied Wagtails were a'courting. He was fervently bowing up and down, while she crouched down before seeing him off with a warning wave of the bill. It's been an interesting day. It didn't start promisingly, since the Ring Ouzel wasn't seen again after the early morning. But we had a phone call from Will Bowell mid-morning to say that Josh Jones had found a nearly summer-plumaged Spotted Redshank at the bizarrely-named Grummit's Scrape. Managed to get out at lunchtime (first piece of lunchtime twitching since passing driving test). When Dr Weedon and I turned up, there was not a lot to be seen, and certainly no Spotshank. We were despondent and on the verge of leaving the hide when we heard a 'chewit!' Soon enough, the dusky beauty popped out from the edge of the scrape and it showed fairly well until we left. I took some hasty pics but they're abysmal. If you want to see them, click here and here. But Josh's are much better. I'd forgotten how much I love Sparklehorse. Highly recommended. Much more interesting was the Cuckoo that flew in front of the car near Helpston. But extremely annoying was the Little Gulls at Ferry Meadows CP at 15:00! All gone by 17:00. There seems to have been a bit of a movement today. I feel obliged, should there be anyone else reading this, to explain what birding is. It's probably better known as birdwatching, the act of watching birds. Yes, blokes, you can make jokes like "I like watching birds but not the ones with feathers! HA HA HA!" but we've heard them all before and they still aren't funny. A good phrase to summarise what watching birds is about is used by the RSPB for one of their campaigns. It's: "Aren't Birds Brilliant!" Birding doesn't have to involve vast numbers of birds, or a rare or spectacularly-coloured species, or ones with beautiful songs, though it can be any of those. It could be something as simple as watching a Starling probing for leatherjackets in a lawn, or a Chiffchaff, newly-arrived from Africa, picking its way through a hawthorn bush. Or a House Sparrow building a nest under roof tiles. These are all fairly mundane things that you can see on the way to work every morning. I find watching birds go about their daily business fascinating. There is so much about them that we don't fully understand. Actually, there are plenty of things that we have no idea about. How do birds navigate their way around the world? Why do some species agitate ants' nests and then wait for the ants to crawl all over them? How do birds tell each other apart? We may never know for sure. On the other hand, spectacular birds, or ones that do odd things, are extremely interesting. One of my favourite sounds is the 'drumming' of the Snipe. It's a small wading bird with a long, sensitive, slightly flexible bill which it uses to feed in soft ground or mud. The Snipe 'drums' by flying high up in a display flight, then diving earthward and fanning out its outer tail feathers. They vibrate, making an audible humming noise. Anyway, what I'm trying to get at is that birds are fascinating beings. They are constantly doing things beyond our comprehension. They are all around us. They come in many different shapes, sizes and colours, and are adapted to just about any environment and extreme condition you can think of. Compare penguins (ice and intense cold. Incubates its egg/chick on its specially adapted feet) and sandgrouse (desert and heat. The males carry water on their breast feathers to their young at the nest). Birds are immensely strong (eg. Arctic Terns spending 'our' winter in the southern hemisphere, then breeding in northern Britain; tiny warblers migrating year after year to and from Africa), and at the same time delicate and beautiful (look at the same warbler up close and you wouldn't think it capable of such a feat). In short, birds enrich our lives and my life is improved immeasurably by them. I think this is my best photo to date. I was just giving up on trying to digiscope Meadow Pipits when this one perched on a fencepost for a few minutes. There's always the 'do I or don't I try to digiscope it?' quandary - I seem to spend half my time carefully moving into position, only for the bird to fly off at the critical moment. Fortunately, it stayed put for several minutes and the meadow made a good background. They're very under-rated birds. I think it must have been watching flies above its head. Chris and I went down to Steve Dudley's garden with the aim of trapping and colour-ringing some House and Tree Sparrows. Steve had counted a maximum of nine Treeps in the garden at any one time, so it was a bit of a surprise to catch 13! Over the next few weeks, he counted another nine which had escaped the nets, making a total of at least 22 individuals. The House and Tree Sparrows we caught were fitted with a standard BTO metal ring on the right leg, and a red plastic ring on the left, as part of a research project into sparrows in the Fens. Hopefully we'll be able to do a return visit in the autumn when there are plenty of juveniles in the garden.